There are many pure substances which make the peculiar shape crystals when these become the solid. Let’s make the alum crystal which can do in short period. 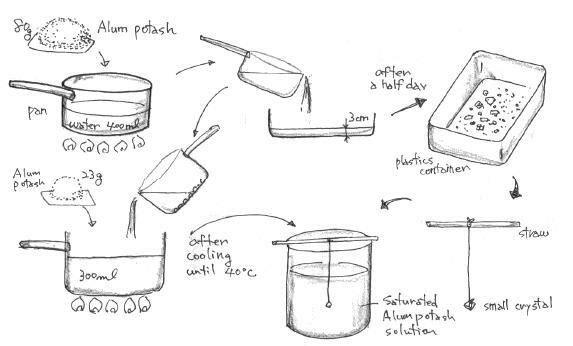 Put alum potash 80g and water 400ml in a pan. Heat it until all the alum potash is dissolved. The solution is poured in a plastic container about 3mm in depth. Small crystals are made after a half day. Take one crystal which is good shape and transparent. Tie the crystal with the string. Opposite of the string is tied to a straw. Wash the dust from the surface of the crystal and the string in water. Put the saturated alum potash solution 300ml to another pan.The alum potash 23g is added in it and it is heated again. Cool down the solution up to about 40℃. The solution is put in the glass cup. The crystal is put in it, too. Cover the cup mouth with paper not to enter the dust in it. The glass cup is put in the styrene foam box or the cooler box. Leave it for two days. The salt (sodium chloride) makes a cubic crystal. However, it takes several months to make a big crystal in the laboratory. There is salt mine in the Salt Range. The cubic crystals of the salt sticking on the wall can be seen in the mine.